An audacious depiction of gang violence, dead-end lives, and the ties that bind, Rumble Fish remains a cult favourite and features magnificent cinematography by Stephen H. Burum, a Golden Globe-winning score by Stewart Copeland, and a remarkable cast that also includes Nicolas Cage, Chris Penn, Tom Waits, and Laurence Fishburne. 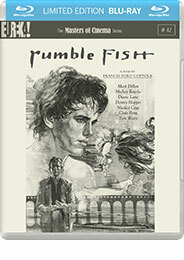 The Masters of Cinema Series is proud to present the world-première release of Rumble Fish on Blu-ray. 40-PAGE BOOKLET featuring a 1983 interview with Coppola, the film’s original promotional notes, and rare archival imagery.